The inkjet printer is a relatively new invention, replacing dot matrix only 15 to 20 years ago (although the first thermal inkjet printer was actually developed in 1977). Over the last 15 years, inkjet printing technology has seen an explosion in innovation to the point where it now seems that almost anything is but the choice of technologies can be overwhelming for print service providers (PSP), never mind your everyday customer. Inkjet works on the principle of a drop of ink being propelled from the ink printhead and onto the media at precisely the right time to produce an identifiable image at increasingly impressive speeds. Firstly, let’s cover some of the technical differences…Aqueous (which means it is water-based) inks are dissolved in water which is a polar substance. Solvent inks are dissolved in a solvent which is a non-polar substance. Now let’s align this with substrates…paper is polar & plastic is non-polar. Aqueous inks absorb well into paper because both are polar. 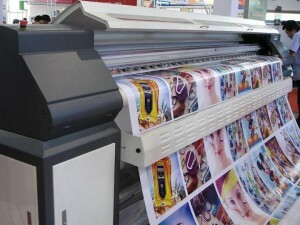 Likewise, solvent inks adhere well to plastic media such as vinyl banners because both are non-polar. Therefore, if you want your finished product for interior display (such as poster or fine art photography prints) you can use a water based aqueous printer which will create extremely detailed images. Modern pigment inks can often be defined as archival which means that under the right conditions the quality of the print can be expected to last up to 200 years! 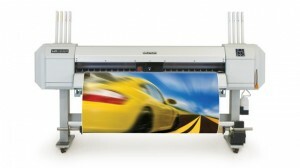 The scale of water-based prints is usually limited to 60 inches width. Aqueous inks produce beautiful results on paper but cannot stick to plastic unless the media is coated. This involves lining the vinyl or plastic material with a thin emulsion (giclee inkjet coating) that will accept the aqueous solution; this can be expensive procedure and therefore this is sometimes reflected in the price of the water based rolls. These banner and vinyl materials can be recognized by the clay-like feeling of their surfaces. As the ink is water-based the emulsion is easily scratched, prone to kinking and doesn’t really appreciate water, which in turn limits the outdoor life of some products to about 6 months. To overcome this these prints can be laminated to improve their resistance to moisture and scratching. Is your print going to be exhibited in an exposed exterior environment? As a rule of thumb, things that might get wet need to be waterproof and this also applies to printing. Therefore both the media and the ink need to stand up to weathering, which requires an aggressive ink chemistry known as solvent or eco solvent printing. These inks allow you to print directly onto uncoated plastics and there is a wide range of cheap PVC and paper based medias, which are used to produce anything from banners to vehicle wraps. The life of these prints is usually up to 3 years unlaminated. Another plus point of the solvent equipment is that size is commonly known up to 5 meters wide, allowing you to create prints on a huge scale. Solvent printers are a relatively recent development in inkjet technology and one downside to them is that they are a much larger investment than their aqueous siblings. There is an environmental question over solvent ink & media however it is the solvent inks’ ability to print directly onto banner vinyls and other plastics at production speeds that makes them so valuable. One technician pointed out that a solvent printer is unique in that it heats up the media being printed upon to allow the solvent to actually penetrate the plastic, leaving the ink embedded in the media! This means that solvent-printed vinyl medias are very scratch resistant and can be exposed to water and weather for years without harm. Designdirect Supplies was established in 1975 and has more than 40 years experience all over the UK. 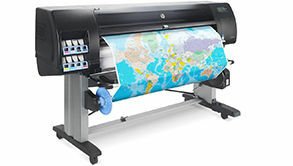 Whether it be Glasgow, London, Aberdeen, Leeds, Edinburgh, Manchester, Dundee, Liverpool, Isle of Skye, Doncaster, Inverness, Isle of Man, Southampton or Isle of Wight we can deliver plotter paper to all 4 corners of the British Isles! We specialise in supplying Plan Printer/Copier, CAD/GIS Inkjet, Aqueous, Solvent & Latex materials. View our range online – we will be launching some exciting new products in the next couple of months…watch this space! * The printer market is a fast-changing market and this is just a brief list of some common printers. Keep in mind that manufactures will be adding to this list all the time and that they discontinue older models.